This year we've seen Simon Pegg return as Scotty in Star Trek Into Darkness and complete the Three Flavors Cornetto Trilogy for director Edgar Wright in The World's End, but now we have a look at Pegg as you've never seen him before. At the American Film Market, buyers are getting a first look at Pegg in an Australian thriller called Kill Me Three Times. Featuring a Down Under native cast that includes Luke Hemsworth (brother of Chris and Liam), Sullivan Stapleton (300: Rise of an Empire) and Teresa Palmer (Warm Bodies). 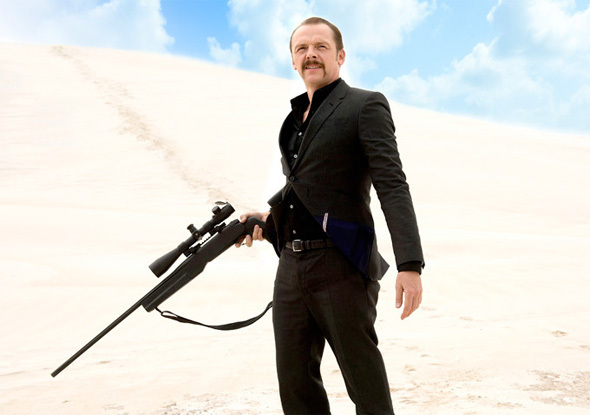 In the film, the story unfolds from three different points of view, and in the first look photo, you'll see that Pegg is playing an assassin who looks straight out of a Robert Rodriguez movie. Kill Me Three Times is directed by Kriv Stenders (Australia's hit Red Dog) and written by newcomer James McFarlan. The story follows Simon Pegg as a professional assassin, hired to kill the singer wife (Alice Braga) of a wealthy man (Callan Mulvey). Other characters include a gambling addict (Sullivan Stapleton) trying to pay off his debts through a life insurance scam thought up by small town girl Lady Macbeth (Teresa Palmer), a corrupt cop (Bryan Brown) and a surfer (Luke Hemsworth) trying to save Braga from her would-be killer. The film is being sold at the American Film Market and doesn't yet have a release date. Awesome! Happy he is taking on different roles. Sounds good. I hope it's a more dramatic role. Cool! Gotta see this one!